'Breakfast in the Garden' by Frederick C. Frieseke, 1916. Donald G. Gardner became a summer resident at Ojibway Lake outside of Ely, Minnesota in 1941. 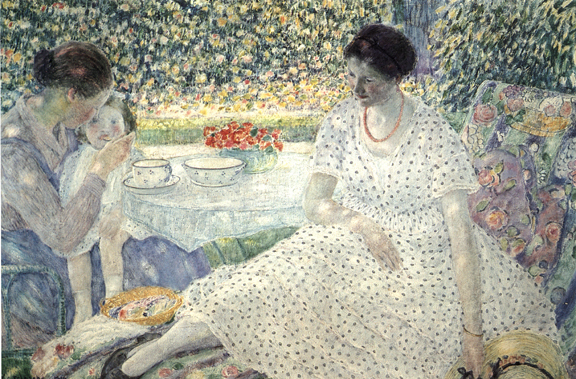 In 1944 Gardner donated a painting by Frederick C. Frieseke titled Breakfast in the Garden to the City of Ely. The painting was hung in the Ely Public Library in 1945 where it was admired for over 40 years. In 1989, the painting was sold for $510,000.00 to a New York gallery and the City of Ely established the Donald G. Gardner Humanities Trust to enrich the community through arts grants and scholarships. To date the Trust has awarded more than $625,000 back to the community artists and art organizations to enrich life in Ely. Donald G. Gardner was born in 1889, in Monticello, Indiana. He was a wealthy, pleasant businessman who founded Gardner Publications in 1928. Called charismatic and civic minded, Gardner was an amateur photographer specializing in 16 mm film and an art collector. In the 1940s he gave money to paint the Ely City Hall. At one time he donated Russian Brown bears to the Cincinnati Zoo. Donald Gardner primarily collected paintings by Cincinnati artists, the Frieseke painting was an exception, and he particularly liked Impressionist works and art done of American Indians. Don Gardner died in 1947 at the age of 58. ﻿Read more about Gardner. Frederick C. Frieseke was born in Owosso, Michigan in 1874. He began his art training at the Art Institute of Chicago and the Arts Students League in New York City. Frieseke went to France in 1898 where he remained until his death in 1939. Frieseke’s innovative techniques gained him international fame following his abundant representation of 17 paintings in the 1909 Venice Biennale. The painting Breakfast in the Garden was completed in 1916. Read more about Frieseke. LIKE US on Facebook for the latest information on grants, artist works and events!